Zella's debut self-titled EP has just been released, and she is receiving all kinds of love from critics and listeners alike -- and it's no wonder. Her EP is nothing short of magical, and in addition to being one of Spotify's Top 10 Rising Stars to Watch, her new single, Hypnotic, just spent time as the iTunes Single of the Week. Zella is heading out on tour this month, and I caught up with her this week to chat about her music, this whirlwind year she's been having, and what the west coast has in store with her live performances just around the corner. If you have the chance to see this woman play this month, I suggest you take it! She's rad. Logan Lynn: Hi Zella. Thanks for chatting with me today. I love your new video, and your music is exquisite. You have had quite a year! Congratulations. Zella Day: So glad to be hanging out with you. Thank you. Lynn: How did all of this come about? Day: This all has been a building process. Nothing has been handed to me. I've taken advantage of all the opportunities that have come my way by working hard. It feels good to see people responding to my music. Lynn: Resourcefulness is key these days in the music world. I don't often hear stories of folks being handed things, so it's nice when hard work is rewarded with people digging what you've been working so hard for. It sounds like you had a killer CMJ experience, and now you are taking your show on the road. What can people expect from your live performances? Day: I'm going to be on the road starting February 10th for nine days. I begin the tour in Santa Barbara at the Soho and then travel up the coast. I'm going to be adding a couple of new songs from the full length record that nobody has heard yet. I can't wait to break those in live. Lynn: Oh, that's exciting - and you've just released your self-titled EP to critical acclaim. Are you working on new material for a full-length? Day: The record is complete. I've got so much in store for this year it's insane. Lots and lots of surprises! Lynn: I love surprises! Who are you working with this round? Day: I worked with the same two producers on this record over at WAX studios, Xandy Barry and Wally Gagel. Lynn: That's bound to be special. When did you make the leap from Arizona to Los Angeles? Was that for music? Day: I moved from AZ to Long Beach three years ago because of some family stuff. Music wasn't the catalyst for the move but it was part of the equation. I resided in LB for two years until moving up to LA a few months ago. That move alone has changed my life drastically, since I'm much more immersed in the music scene here. Lynn: That's quite the scene to find oneself immersed in. Who are some of your favorite artists? Anyone out there right now that you are dying to collaborate with? Day: My mouth is watering for the new Father John Misty album. Maybe someday I'll make my way into a song with that guy. Lynn: That would be rad. You've been compared to Chvrches and Lana Del Rey, amongst others. I know from personal experience in this industry that critics love to put people into boxes and make comparisons, often missing the point. Do these comparisons feel right to you? Day: I feel like comparisons can be very counterproductive in the art world. It's no fun to categorize somebody's self-expression. I make the music that flows through me and that's all I can ever do. Lynn: Agreed. I think of the music I make as a piece of my humanity, and how can one categorize someone's humanity? For people reading this who may not already be familiar with you, how do you describe your sound to people? Is there a feeling experience that guides your process? Lynn: I can see those. I would add "bright" and "amazing" to that list if I were making it about your songs, but that's just me gushing again. After your tour, what does 2015 hold for you? I'm guessing big things. Day: I'm anticipating a lot of change this year. My whole life story is about to be released on a record. Lynn: That can be so intense, and also such a beautiful, liberating experience! I'm really looking forward to hearing it, and much more from you over the years to come. Anything else you would like to leave our readers with today? Day: I hope to see you at a show, I would much rather sing you a song in person. 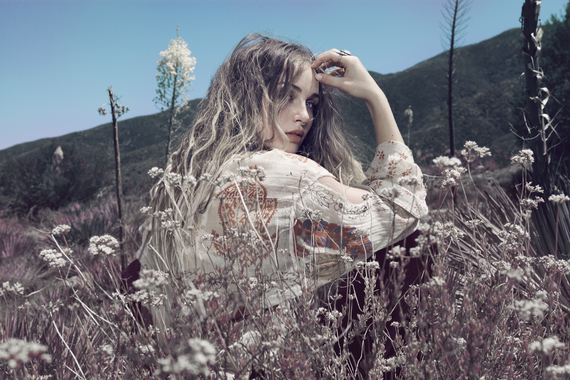 For more on Zella Day, visit her website, or follow her on Facebook, Instagram and Twitter. For more on Logan Lynn, visit his website, or follow him on Facebook and Instagram.